Halloween decor can be as formal, elegant and refined as you like, and can easily incorporate the colors and themes of the season without making your living room look like a haunted house. Make Halloween an affair to remember with these gorgeous living room decor ideas. Drape your fireplace with a large black ribbon, stretching from end to end. Be careful not to let it hang too close to the fire. Tie a bow at each end for a classic look, or fray the edges for a slightly sinister Halloween effect. Line the top of the mantel with monochromatic accessories, especially Halloween colors like black, silver or ghostly white. Sticking with a single color theme adds impact and elegance. Line a row of spray painted pumpkins down your mantel, or group them on each end. Try metallic gold, silver or bronze for a unique and chic take on the traditional harvest decorations. Floral arrangements in muted shades of yellow, orange and deep reds add autumn color without appearing overwhelming. Black lace draped across the top of the mantel adds timeless elegance, and a hint of gothic Halloween decor . Spray paint a leaf garland black, adding drama and allowing it to keep with a black monochromatic theme. Metallic candles in silver add a high-class touch to ghost-white Halloween displays. Try setting them on white candle holders around the living room to cast a haunting glow on your decor . Black and white candles remain within the Halloween theme and add modern style. Try dripping white wax onto the edges of black candles, and vice versa, for a refined, modern Halloween candle display. Candelabras are a great way to add antique, eerie style, while retaining the classic look of the elegant candleholder. If you already own some, simply place them on your coffee table, side tables or fireplace mantel. Otherwise, search thrift stores for old candelabras, then spray paint them black, silver or white for a chic Halloween candle display. 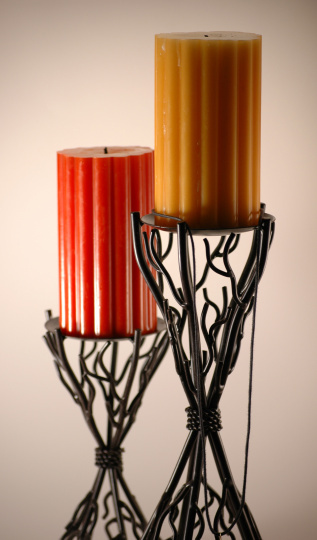 Use tiered pillar candleholders on tables around your living room for a flickering All Hallows’ Eve light show. Fill them with black candles for a darker effect, or try white and silver candles for a spritely look. Bronze and other metallic pillows are a fun way to add style and elegance to your living room furniture, while incorporating traditional Halloween colors. Black and white pillows remain a classy way to add modern elegance and a Halloween touch to your living room. Try grouping several black pillows on larger couches for a darker, high impact look, all without compromising the room’s unified style. Even traditional black and white patterned pillows take on a newly haunting look when set in a living room decorated for Halloween. Metallic pumpkins are one of the best ways to elegantly decorate your living room for Halloween. 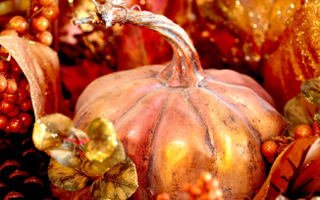 Purchase real or fake pumpkins, and simply spray paint them gold, bronze, silver or iridescent white. Place them anywhere around your living room, in groups or alone. Glitter pumpkins are another fun way to dress up traditional Halloween gourds. 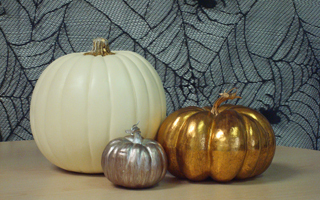 Use spray glue to cover a real or fake pumpkin, then cover it with black, white, gold, silver or bronze glitter. White pumpkins are a good choice for subtle and chic Halloween decor . Paint the pumpkins white, then place them along your mantel for a ghostly arrangement, or on tables throughout the room. Stack several small pumpkins, painted, glittered or plain, inside of a glass hurricane candleholder. They will be clearly visible, but stylishly contained inside the glass. Set small pumpkins on top of pillar candle holders in place of your regular candles. Keep the pumpkins orange for a more traditional look, or paint the black, white or silver to give them even more of an elegant appearance. Instead of cutting pumpkins into classic jack-o-lantern patterns, try using your pumpkins as stylish lanterns. Cut small circular holes, dashed lines or star patterns rather than a face, and paint the pumpkin black, white or silver. Set the pumpkins around your living room anywhere you’d like decorative, subtle light. Apothecary jars are a chic and Halloween appropriate way to decorate your living room and set out candy and treats. Find small to medium glass apothecary jars at a craft or retail store, and fill will your favorite candy. To amp up the Halloween decor , try filling some of the jars with fake spiders, or dyed liquid to appear like potions. Just be sure to separate jars with edible items from those filled with inedible decorations. Black, white and red rose floral displays are a great way to add gothic elegance to a Halloween theme living room. Set them in a clear vase for a subtle nod to the season, or try placing them in a black ornate vase for a dramatic but chic look. Tree branches found around your yard or bought at a craft store can easily be turned into Halloween pieces of decor . Paint them black or white, then place in a tall vase. The branch will look like an eerie autumn tree, but can be lightened up with metallic pumpkins, ghosts or skulls hung from its branches. Any pieces of decor your currently own in black ironwork will instantly fit your living room’s Halloween theme. Candleholders, statues, wall sconces and fireplace tool sets in black iron won’t need any adjustments to blend in perfectly with your elegant Halloween decorations. Creating a tasteful Halloween theme in your living room is easy if you follow a few simple steps. Pick one or two colors to decorate with, and follow through with the monochromatic color scheme. Black and white are great options, but can be used in conjunction with a few key decorations in orange, silver, bronze or gold for a striking contrast between colors. Paint pumpkins to instantly take them from harvest produce to chic decor , and antique candelabras, lace and ribbons for a final touch of Halloween style.